First of all, you're going to want to create your parts seperately. Be sure that there is a big enough place for the two parts to overlap: If you don't, the connection will be weak and your element (or elephant, haha) might break once moved too many times. If you're not painting or drawing a new character like me, and just want to animate something existing, like a magazine cut-out of Hugh Jackman, you can use cardstock to both reinforce your pieces and create an extra lip for your pieces to overlap. Cut out your dude, and then oh-so-carefully cut out his head. Gluestick both pieces to the cardstock. Cut out the head, and then when you cut out the body, leave an extra lip at the top (imagine you are extending the neck). Now you're good to go! Now that you've made your mental note, use a pencil to make a dot on the backside of the head and the front of the body to mark your swivel point. If you forgot, or lost it when you flipped the head over, just repeat the last step, "trying the head on" and renewing your mental picture. Next, punch a hole in the BODY ONLY, not the head. For this project, I used my 1/8" hole punch and a mini-brad to keep the project small-scale enough for an ATC. If you make your elements bigger, a standard size hole punch and regular size brads will work nicely together, but may be more difficult to hide. I honestly suggest getting a mini-hole punch if you do a lot of papercrafting and if it will fit into your budget. I use mine ALL the time! Now, glue the mini-brad onto the backside of the head. I love to use hot glue because it's instantly strong and won't wrinkle my papers. Pay attention to which way the spikes will fold down. Once they are folded down, they might stick out from behind your elephant if your brad was glued on wrong. You're almost done!!! Slip the hole in the body over the brad spikes and then flatten it out by separating the bradspikes and pressing them down to the page (Did I really have to explain how to use a brad? Ummmm...) The movement will be pretty loose, so if you don't like that, gently press down on the flattened brad with something hard. I use the capped end of my gluestick. If you press too hard, it won't move at all, but if you get it just right, the piece moves perfectly on demand and stays where you put it. And now that's it! You can glue it onto whatever you want. Just be careful not to glue the brad and the area around the brad. Remember, it still needs freedom to swivel. This is kind of one of my first tutes, so if you have any questions, or if anything is unclear, just comment and I'll do what I can. Have a beautiful Thursday! Awesome Kira! I can't wait to do this on some of my own atcs! Thanks so much for posting this tutorial. Brads have been added to my shopping list! Wonderful tute, Kira! 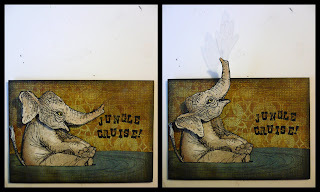 I had been admiring your Jungle Cruise ATC in the gallery and couldn't, for the life of me, find the head to the brad - and it's because you had it concealed. What a cool trick! I think it makes things look more tidy that way. Thank you for sharing. I was wondering how you had done this when I saw you Asia ATC, but you explained it wery well here. Thanks!